The art of fetching and transporting firewood has advanced from the previous conventional ways of getting the firewood from the woods to our homes .Various firewood carrying devices have been invented in order to ensure that this process has been demystified, made easier and less strenuous to the user. Some devices are more efficient than others. Here we will learn about the amazing WoodOx Sling – The Ultimate Firewood Carrier firewood carrying device that has simply changed how we look at the process of transporting firewood. WoodOx Sling is an amazing timber carrying tool that has come to not only make the process easier but more affordable as well. This WoodOx sling is a phenomenal tool that has revolutionized the timber industry. The WoodOx sling has amazing advantages as well as added features in comparison to other timber carrying tools that make it simply extraordinary. The WoodOx sling has a very comfortable feel to it due to its amazing design that uses the principle of Centre Of Gravity. This principle balances out the weight of the timber in order to ensure that there is less strain on the user’s back, shoulders and arms. The firewood is places under the user’s arms ensuring that the firewood’s weight is evenly distributed to the whole body thud reducing strain on the back, arms and shoulders. This goes a long way in preventing long term back pains as well as shoulder and arm pains. The WoodOx sling has an in built LED flashlight that makes everything easier as you do not have to carry the firewood bag along with the flashlight. This makes the process of carrying the firewood easier and less cumbersome. The LED flashlight that comes with the WoodOx sling is up to ten times brighter than the normal flashlights we find in the market currently. Well, this makes things a lot easier since you can now fetch your firewood even during night time! The LED flashlight that is incorporated in the WoodOx sling can last up to 10 years without the need to change out the batteries or have them replaced. With this information in mind, we can confidently conclude that the WoodOx reduces the cost spent on changing out your batteries every other time. The WoodOx sling has been fitted with heavy duty canvas that allows the user to carry more timber without feeling the extra strain on the back, shoulders and arms. The high load carrying capacity also allows one to carry logs of different lengths without also the extra strain due to the heavy duty canvas as well as the ergonomic design incorporated into the WoodOx Sling. 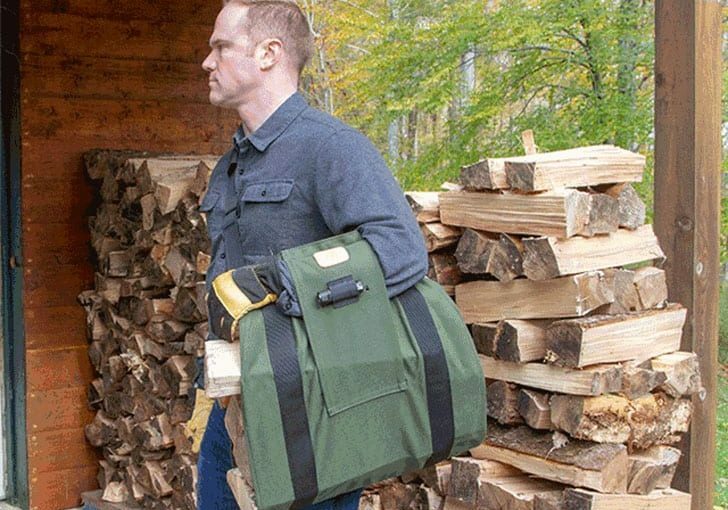 The WoodOx sling is made using a heavy duty canvas that goes a long way in increasing comfort to the user during the firewood carrying process as well as giving the user the freedom to carry more logs of timber without having to worry about the extra strain on one’s back, shoulders and arms. This heavy duty canvas has 3 major advantages to it that make the WoodOx sling more preferable to the user than other firewood carrying tools. These advantages include: Durability, mildew resistance and breathability. The canvas provides adequate protection to the timber from water as it is made in such a way as to not allow water to get to the timber. The heavy duty canvas on the WoodOx allows one to be able to use the sling during all seasons. This WoodOx is also scratch resistant due to the high quality canvas used to make it. The ergonomic design employed in the making of the WoodOx sling ensures that the risk level posed to the user during the firewood transporting process is greatly reduced if not completely done away with. The principle of the center of gravity ensures that once the user places the WoodOx sling underneath the arm, the sling allows for even weight distribution throughout the whole body. This reduces strain on the arms, shoulders and back thus making the process a lot less strenuous and more comfortable. Other firewood carrying tools or devices have been designed in some sort of ‘ shopping bag’ style. This kind of design proves to exert more weight on the shoulders as well as from the sleeves of the arm upwards. The Wood Ox sling type of design ensures that this firewood weight is distributed evenly throughout the body. 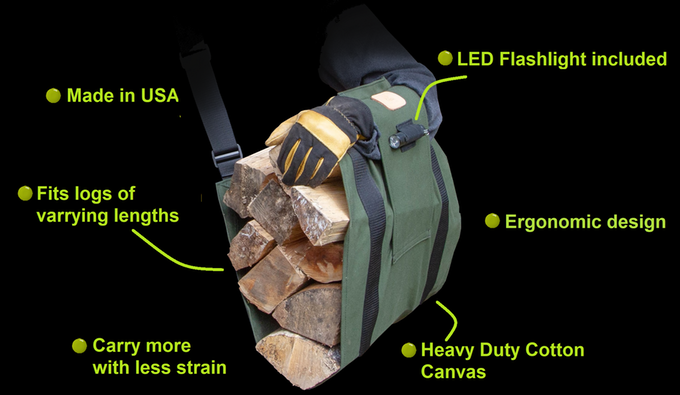 It is evident to see that the WoodOx sling is the ultimate firewood carrier. The WoodOx has come to revolutionize how we carry and transport our firewood. It has made it a lot easier and a lot less dangerous to carry our firewood . The sling kind of style has made it so much easier to move our hands around while still carrying our firewood that is safely and tightly held in place underneath our arms. This ability to move our hands around freely has gone along way in preventing slip ups while carrying the firewood as well making it easier for the user to open doors, bend more easier thus making the firewood process less dangerous and less strenuous to the arms, back and shoulders. The ergonomic design of the sling helps to fasten the firewood so that it is held tightly in place thus not posing a threat of dropping. This secure way of carrying firewood using the WoodOx makes it less cumbersome and the ‘all over the place’ kind of feeling. The design also reduces the chances of the firewood carrying device from swinging precariously on the users knee thus causing injury or damage to the user due to the awkward position of having it designed with a ‘shopping bag’ style to it. The WoodOx Sling which by now is very evident that it is indeed the ultimate firewood carrier is available on kickstarter.com at a very friendly price putting in mind the benefits and advantages that come with it in comparison to the firewood carrying devices that have preceded it. Get yours now and revolutionize how you carry your firewood.